Welcome to Sepia Scenes! Glad to have you stop by and leave a comment! I have a sepia Valentine for you today. I know there's another Sepia Scenes post before February 14 but I just wanted to offer you this photo! If you would like me to send you a Valentine's postcard in sepia send me your snail mail in e-mail. My e-mail address is at the bottom on the right. I'll send it in an envelope and I'll leave it blank so you can send it to someone you love! The sepia angel evokes his affection for the subject of his attention. So adorable! Beautiful postcard to look at - and especially receive by Feb 14! An adorable sepia angel. Perfect for a a valentine card. My sepia is up now. Good morning Mary. Sweet little Valentine. If you sent one to me I would be thrilled. Great photo and good choice of subject for your postcard. A sweet cupid. So calm in sepia. What a beautiful little angel! And so perfect for Valentine's day. Beautiful shot and nice shadows Mary, here is my post for this weeks meme. That's a pretty sepia post card. 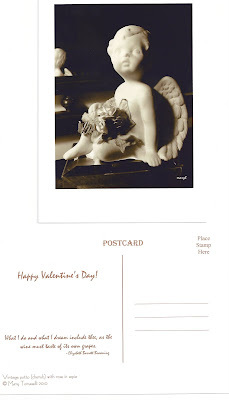 Mary, I love your cherub - such a gorgeous Valentine card! your little cherub is absolutely darling. Cherub is a lovely figure to express love during this Love season. The sepia gives this such a soft sweet and romantic look. Lovely Mary! I don't see Mr. Linky but mine is up now. It´s so sweet. I really do love angels. I have some in my home. What a sweet face that cherub has. Perfect for sepia. 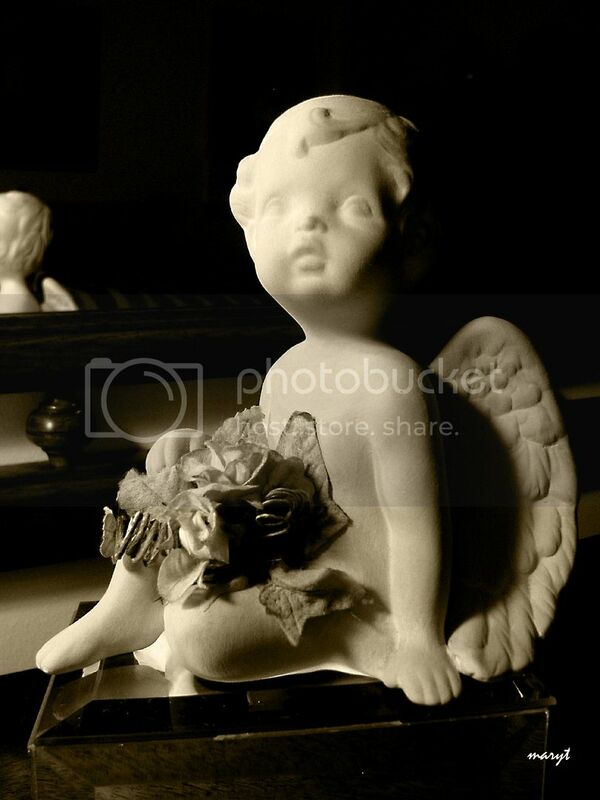 This cherub certainly looks vintage in sepia tone. It makes a wonderful old-fashioned Valentine card. This looks so sweet in sepia, MaryT! Mine is a valentine type one too. The cherub is so classic Valentine. Great subject for sepia too. awww that angel's face is soo cute :) perfect sepia! Great little angel shot, and what a sweet postcard! 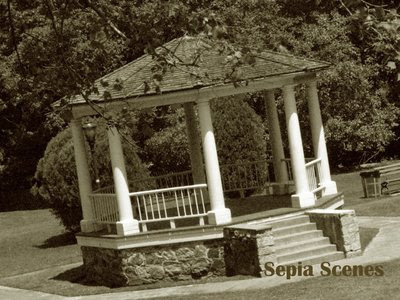 It's A Blog Eat Blog World for this week's Sepia Scenes! Love your little angel in Sepia. She's pretty! Have a great day! that's lovely! I would not of thought that a Sepia valentine would be so appropriate. Such a nice surprise.